Let your soul experience one of the most stunning and pristine places on earth, Western Australia’s Kimberley. Its coastline is so unspoiled, dinosaur footprints still smatter the rocks. Its oceans are so untouched, whales nurse their young in its warm waters. Its indigenous culture is so ancient, no other can match it. The Kimberley is more than a remarkable region in Western Australia; it’s one of the most fascinating and least explored places in the world. As world travelers seek unexplored destinations, The Kimberley has been added to their bucket list of dream vacations. This is a place that commands explorers to indulge in its many wonders. Both magical and rugged, Western Australia’s Kimberley is one of the few last wilderness areas, like Alaska, Galapagos, Antarctica and the Amazon, where you feel the rawness of the earth and the wonder of nature with an ancient story. Immediately, there is a deep intangible presence in the Kimberley that is at once powerful yet calming. Night-blooming flowers from the giant Boab trees make the air fragrant while the night sky glitters with millions of stars. The gateway to the Kimberley is the small pearling town of Broome, home to some of the largest and most prized pearls, where camel rides on Cable Beach is part of everyday life and where nine sets of dinosaur footprints cast as massive fossils. The influence of the pearling industry, with its melting pot of cultures and cuisines, has helped to create the distinctive character and charm of Broome, which offers select beach resorts, a unique calendar of events and exquisite dining options, including locally caught fresh seafood. 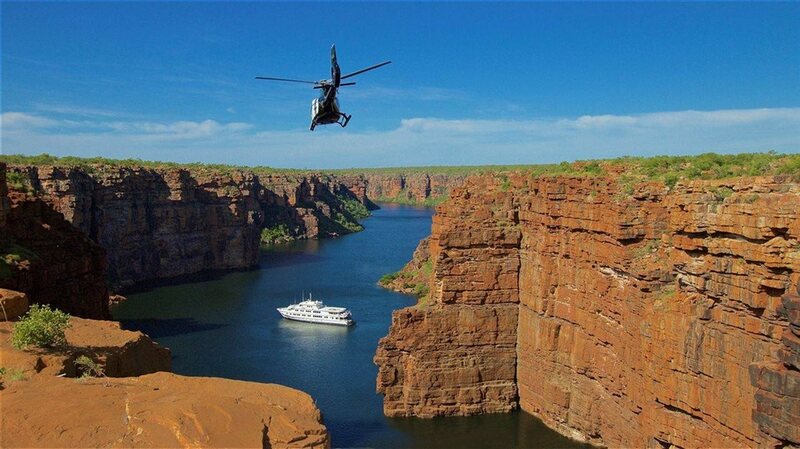 The best way to experience the Kimberley is through expedition cruising. A unique collection of companies operate boats that take passengers to the region’s most pristine beaches and reefs, to towering waterfalls so close you can feel the fresh mist on your face, through ancient gorges, and to 350-million-year-old rock formations. Through expedition cruising, you will likely place your footstep where no one before you has ever been. In this remote setting, visitors can encounter the true icons in Western Australia’s North West, including the natural phenomenon of the Horizontal Falls, the majestic 260-foot-tall King George Falls, and the Rowley Shoals featuring coral atolls home to 700 tropical fish species and considered among the best dive spots in the world, where not more than 500 people visit in a year. Just because you’re exploring one of the last untouched wildernesses on the planet doesn’t mean you can’t indulge. Both adventurous and luxurious, Kimberley cruises bring the savvy traveler to places few humans have seen while offering them the comforts of a delicious meal showcasing local flavors (or your own catch of the day), soft beds, and services that connect travelers with the people and the land. Every cruise is different. Many have on-board naturalists and experts that guide excursions and open the wonders of the region to curious passengers. Some high-end cruises have a helicopter to take you to the top of the cliffs and give you an unrivaled view of this unforgettable world. Before heading to the Kimberley, explore Western Australia's capital city Perth, home to many extraordinary experiences, including one of the world's largest inner city parks, stunning metro beaches, a lively food and wine scene, marine encounters, and the State's oldest wine region. Perth is the fastest-growing (and sunniest!) city in Australia. To find the cruise that’s right for you, check out the Kimberley Expedition Cruise Guide, an invaluable resource that showcases a number of companies offering world-class excursions throughout this stunning region, or visit Down Under Answers, Qantas Vacations and Southern World.